It always strikes me as ridiculous when so-called religious laws (which are just as man-made as any other and are always anachronistic) are allowed to prevail over more recently made, more appropriate laws. This applies especially to countries which claim to be secular but then allow the inflow of people who claim that their own religious law takes precedence over the laws of the country they are emigrating to. Of course, at the present time, this means Sharia law and immigrants who claim that it takes precedence over the laws of the country they are emigrating to. I wonder why all these countries do not require of immigrants that they attest – in writing – to their acceptance of the local law of the land over any religious law. The new President of Gambia has realised that there may be more disadvantages to being an Islamic country than advantages. 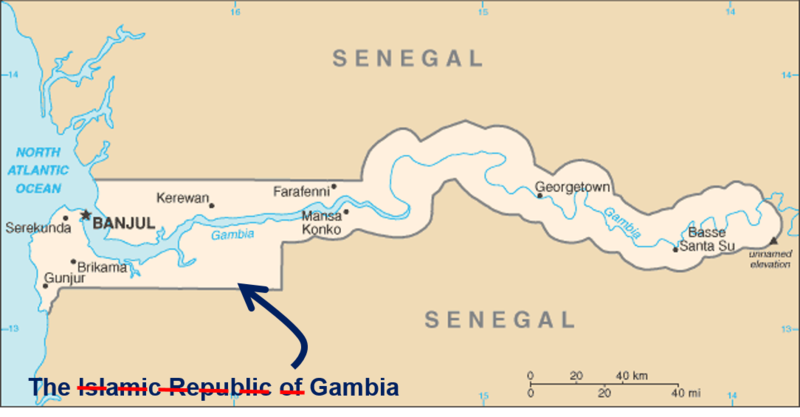 He has changed the name of his country from the “Islamic Republic of Gambia” to “The Gambia”. The Gambia’s new President Adama Barrow has removed “Islamic” from the official name of his country pledging more reforms in the tiny West African nation. In his first press conference since taking over as leader, Barrow said he would soon be overhauling government institutions to make the administration more effective. “The rule of the law, that will be the order of the day,” said Barrow, adding that The Gambia, where Muslims constitute 90% of the population, would no longer be an “Islamic republic”. The word “Islamic” was added to the country’s name in 2015. “The field will be level for everybody, and in total reconciliation, if people reconcile, that will unite everybody, and we want to hold that line… My government will look at all areas and there will be a complete overhaul of the system,” said the new leader. A political crisis gripped The Gambia after Barrow’s predecessor, Yahya Jammeh, the autocratic leader who ruled the African nation for 22 years, refused to step down despite losing the polls in December 2016. Jammeh faces a series of human rights abuse allegations forcing him to go into exile as soon as Barrow took oath from neighbouring Senegal. Maybe it is no longer politically correct to be “Islamic”? This entry was posted on January 31, 2017 at 7:13 pm and is filed under Behaviour, Politics. You can follow any responses to this entry through the RSS 2.0 feed. Both comments and pings are currently closed.